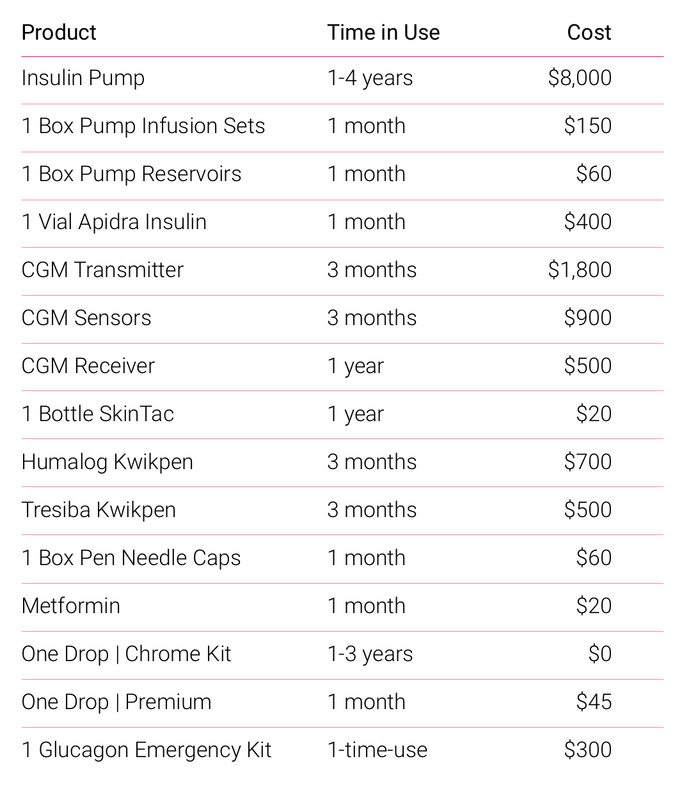 What do diabetes supplies look like without insurance? The prices mentioned in my video vary pharmacy to pharmacy, middle-man to middle-man. The prices reflect the statements I was able to pull from my supply distributor and my insurance company. Many of these supplies cannot be directly purchased from the manufacturer. Meaning? More barriers and walls the consumer hits before being able to understand price-points and breakdowns of what they are purchasing. Ironically, while trying to account for some of my very own supplies, I could not obtain digestible, decipherable, or correct explanation of benefits (EOBs), which sent me down quite a few rabbit holes. The prices reflected in my video (and below) are pulled from my personal EOBs, as well as other prices I found online. They are meant to serve as a general guideline, but can and may vary -- person, to situation, to year. Many of the supplies listed above have a supposed shelf-life. But what happens when something goes wrong? The 3-day infusion sets turn into 2-day or 1-day sets? What happens to your CGM in the midst of a heatstroke? How about in the dead of winter, when your 3-layers of warmth snag at your CGM sensor? What happens when you drop your vial of insulin on the floor and it cracks open? What about when your insulin vial or pen goes bad? The list of variables that could potentially harm or interfere with the product shelf life is endless. You'll still need regular endocrinologist check-ups, as well as the occasional check-ins with other specialists. None of the drugs I mention above account for any of the additional drugs that can become a factor in diabetes management: statins, ACE inhibitors, preventative meds — you get the idea. There's also batteries, chargers, glucose tablets, juices, backup meter, backup insulin, backup needles, backup everything. The prices keep stacking up. Not many of us have $11,000+ on-hand ready to drop for diabetes costs. So what do you do when your company's benefits change? Or you lose your job? Or insurance simply isn't cutting it? Rob Howe jumped head-first into this unknown with his over-the-counter challenge. He walked into his local WalMart pharmacy and purchased vials of R insulin (short-acting, $25) and N insulin (intermediate-acting insulin, $25), along with needles (10ct, $5), all of which are completely over-the-counter and readily available for pick-up at any time. Additionally, he used his One Drop meter and Premium subscription ($45), which allowed him to check his blood sugars as often as needed and get 24/7 feedback on his new regimen. That's where we come in and why we're here. While most insulins and test strips are experiencing major price gauging, we're keeping costs down. Regardless of insurance coverage, One Drop is here to bring affordable, accessible diabetes care to everyone around the world with diabetes and a smartphone. Because we know the struggle is real. We want you to know that you do not have to depend on insurance to survive. You have options. Even if you are going over-the-counter in real life, or if your insurance coverage won't let you check your blood sugar as often as you need -- whatever your case, we're here to make managing diabetes simpler. Easier. Better.